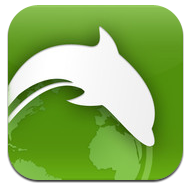 Popular Android (s goog) third-party browser Dolphin has a new version out Monday for the iPad(s aapl). Dolphin HD, like its iPhone counterpart released earlier this month, is free and brings a number of features not available in mobile Safari. But will users embrace an alternative that can never be the default, no matter how well conceived? Dolphin HD has a number of smart features that make it an attractive alternative to Apple’s Safari and other third-party browser options. There’s quick access to full-screen browsing with any site, speed dial for commonly visited site, the Webzine for curating your own multi-source news feed and gesture controls for navigating between pages, tabs and bookmarks. Some of those features are definitely hits. The full screen button is great for reading without distractions, or for viewing rich-media content undisturbed by browser chrome. And the Webzine feature is cool enough to be its own app, akin to something like a simpler, but still quite effective, manually curated Flipboard. Webzine lets you either manually add or choose from a list of text-heavy sources like the New York Times (s nyt) or GigaOM and then presents its content in more of a magazine-style layout. Swiping left and right to call up bookmarks and a list of your open tabs is also a nice touch, although the actual gesture controls themselves and the clumsy implementation of said feature aren’t ideal and usually it’s easier to just tap a button or open a menu to accomplish the same tasks. Overall though, Dolphin HD is great. It looks good, the tabs on tap layout works much better for browsing than the iOS implementation of multi-page browsing, and most of the features mentioned above make browsing the web a much smoother experience. Unfortunately despite the smart additions, Dolphin is still lacking considerably in one major regard: Like every other third-party browser on the iPad, it can only ever really play second fiddle to mobile Safari. That’s because it can’t be set as the default option for opening websites from Mail and other apps — and honestly, that’s really the main job of an iOS browser these days thanks to the rising influence of apps when it comes to mobile Internet usage. There’s also the fact that it’s really just a skin for mobile Safari. Apple insists even third-party browsers use its engine, so there’s little developers can do beyond adding their own features and interface, unless the offload page rendering to remote servers, like Opera Mini. Think about it this way: If you open a link in Twitter that you find interesting and you want to read more, will you just use the “open in Safari” button or actually take the time to copy the address, open Dolphin HD and paste it in the address bar? Chances are you’ll take the path of least resistance like most other mobile users appear to be doing. Dolphin HD is a solid experience on the iPad, as are the iPhone and Android versions. Luckily, the developers have included Webzine, too, which gives users a reason to check it out beyond browsing. But until Apple opens up the coveted default browser spot to offerings from other developers, the triumph of Dolphin HD remains a fairly hollow one. Can anyone explain how Microsoft was forced to give users the option of which browser to use and yet Apple can control their OS with no heed to users wishes? Jailbreak app (I know, I know…) BrowserChanger lets you set many third-party apps as the iPhone Default browser. I use it with Atomic Web Browser on both my iPhone and iPad and it works like a charm! Typos: Paragraph 2, sentence 2. Paragraph 6, sentence 3.